Just a few weeks out from a return to the fray against the Auld Enemy. Always nice to drop in on a friend to celebrate their birthday. 150 years of the English FA, 140 years of the SFA, 141 years of international football and a first Scottish trip to the new Wembley. 14 years on since our last clash, the Tartan Army will snap up their England vs Scotland tickets and arrive in London en masse. England fans, more used to friendlies against the world's best, could be a little less enthusiastic. They could be missing out. Because it might be that, even as we've drifted apart over the years, we share more than ever. A nagging sense of disappointment, a shared frustration borne from very different ambitions forever unfulfilled. Certainly when you buy your football tickets for this one, you're buying a piece of football history. 110 games stretching back to 1872. 45 England wins. 41 Scotland wins. 24 draws. 192 England goals. 169 Scotland goals. Successive generations on both sides of the border might have done their best to widdle whatever inheritance they got up the wall but still, this is a game with a hell of a heritage. So, in the run up to the match at Wembley on 14th August, the Scottish Football Blog will revisit some of those previous 110 games, celebrating football's oldest international through the medium of (mainly) Scottish wins. But I'll start where international football started. The West of Scotland Cricket Club, Glasgow. St Andrew's Day, 30th November 1872. There were over 3000 spectators. 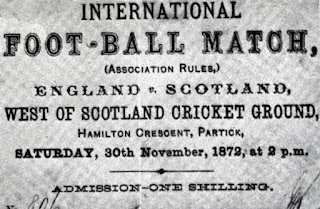 Scotland were represented by 11 players from Queen's Park, selected by their goalkeeper Bob Gardner. This was before the SFA existed. In selecting an international team that could perform to a level of competence, Gardner managed on his own what hundreds of men have struggled to do as part of SFA committees in the intervening 141 years. England arrived as the favourites, a team full of the best talents from the best team in the country. A portent of what was to come? The scratch side of scratch players didn't quite click. 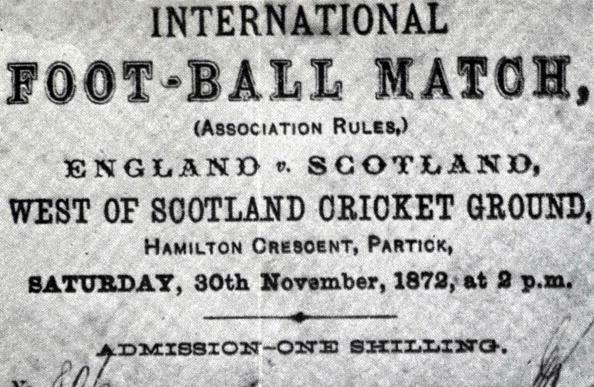 The Scots might have been less celebrated as individuals but they knew how to play as a team. If they couldn't quite vanquish the prototype 'golden generation' they could at least hold their own. England huffed and puffed in a 1-2-8 formation. Scotland, the blue shirts borrowed from Queen's Park, seemed innovative in their adoption of the more balanced 2-2-6. Enjoying the better chances Scotland came close to scoring a couple of times. One attempt was ruled to have gone over the (pre crossbar) tape. Additional assistant referees or goal line technology might have seen it differently. A scoreless draw that could be read as a moral victory. A Scottish habit formed early. As was international football. Expecting to break even, Queen's Park were rewarded with a sizable profit. International football made money. International football was here to stay.